We look at several consumer staple stocks whose dividend yields are very enticing. Solid dividend aristocrats can help you retire earlier and we show you how. The best dividend payers can set you up with income such that their stock price barely matters. Consumer staples and packaged goods companies usually have some of the higher dividend yields in the market. But lately we have seen the dividend yields of some of the bigger names in this group really skyrocket. Unfortunately it’s not due to a large increase in dividends though. Instead it is mostly due to their falling stock prices. Procter & Gamble (PG) and Kimberly-Clark (KMB) have always been two of my favorite dividend paying stocks. And now their dividend yields are approaching 4%. Meanwhile, Colgate-Palmolive (CL) and Clorox (CLX) have seen their yields move towards 3.5% and 3%, respectively. These companies have raised their dividends consistently for over 25 years, which means they are categorized as dividend aristocrats. However, as of May 15th, all of these stocks are down double-digits on a year-to-date basis. Year-to-date, Procter & Gamble, Clorox, Kimberly-Clark, and Colgate-Palmolive have seen declines of 21%, 21%, 14%, and 18%, respectively. So what has caused their stocks to drop so much lately? More and more private label companies are getting into the business of consumer packaged goods, and Amazon is one of them. Amazon is always a threat to any retail business where the item can be shipped. Inflation in commodities has also not helped these companies. 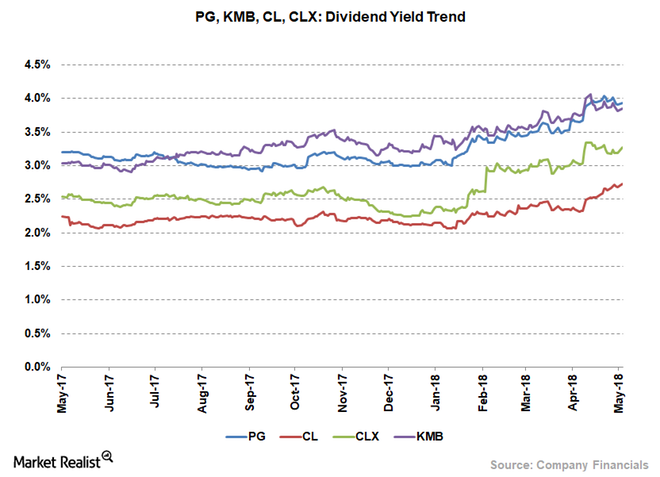 Procter & Gamble, Kimberly-Clark, Colgate-Palmolive, and Clorox are dividend aristocrats, which means they’ve consistently raised their dividends for more than 25 years. However, it’s not only dividend growth that’s driving yields higher. Slumps in these stocks’ prices are also resulting in higher yields. For investors looking for dividend income in retirement this is a great time to take a longer look at these stocks. For those with a long-term view and who want to generate reasonable income in retirement, these are the types of companies we are looking for. Companies with a long history of increasing their dividends and that have a nice starting yield can provide the income one needs in retirement. Take a look at the table below. This is a company with a 4% dividend yield with various dividend growth rates over a 20 year period. Note that in this table I assume a 0% increase in the stock price over the 20 years. The Annual Return above is solely due to dividends. At just a 5% growth rate in the dividend payments, you are locking in a 5.8% annual return over 20 years. This is fantastic compared to treasuries and this assumes no increase in the stock price. Another great benefit of holding the best dividend payers in a retirement fund is that eventually the stock price movements barely matter. As long as those dividend checks keep rolling in, that is all that eventually matters. The key is to be able to cover retirement expenses with income. Increasing dividends over time can do this. I cannot stress enough how important consistent income is in retirement when it comes to your retirement plan. Having enough income to cover retirement expenses in most (if not all) years will allow you to retire stress-free since you won’t have to eat into your investment principal. 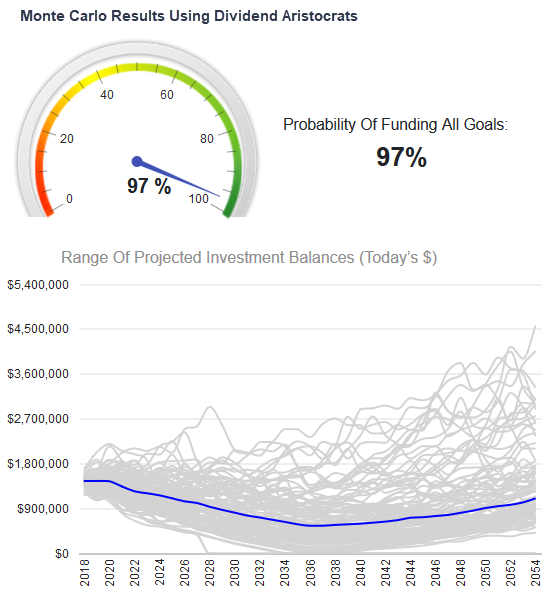 Consistent income helps increase your probability of never running out of money. 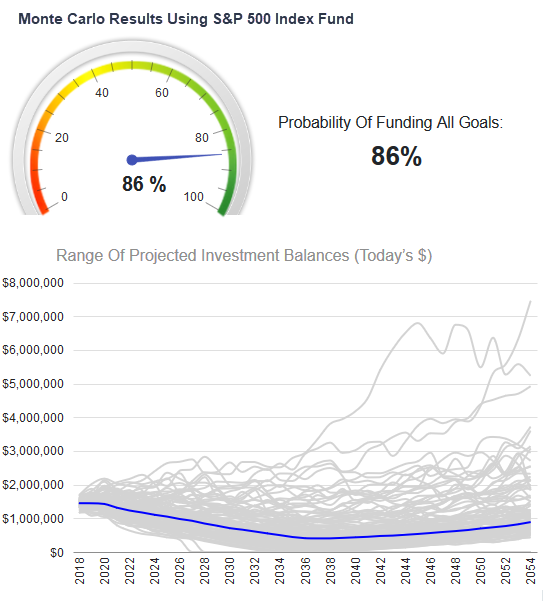 I have seen this many times using Monte Carlo analysis in the WealthTrace Retirement Planner, which is available to the public as well. I have a friend who says he “thinks” he can retire at age 55. He didn’t even run any numbers in a spreadsheet. This is no way to build a retirement plan. You must figure out if your income will cover expenses in retirement. Hoping and praying is not a plan. The best way to start is to find solid dividend payers that can give you the income you need in retirement. Disclosure: I am/we are long PG, KMB. I wrote this article myself, and it expresses my own opinions. I am not receiving compensation for it (other than from Seeking Alpha). I have no business relationship with any company whose stock is mentioned in this article.